Welcome to The Hall of Blue Illumination, the podcast dedicated to the world of M.A.R. Barker’s Tékumel. In this episode, our hosts discuss wargaming and its history with Tékumel. We consider ways in which player characters can become involved with the legions, how to set up military-based campaigns, and issues referees should consider before surrendering their campaign to the whims of Lord Vimúhla. But first, we begin with news from the product pipeline. [00:01:00] Calling in from England, Victor has product news! He’s reviewed a proof copy of the print-on-demand softcover of the Empire of the Petal Throne reprint. [00:02:29] Will this product be available at July’s Gencon? Possibly. [00:03:16] A listener asks about the status of the electronic version of Flamesong. The art is in — from Richard Hescox, artist of the original cover! Flamesong will be available in electronic format, as well as a print-on-demand edition. These will be available with cover art from Giovanna (who drew the cover art to the Zottola Publishing edition) and Hescox. [00:04:28] The Foundation is moving along on the Jakállan Underworld project. They’re also putting together a compilation of Tékumel articles that appeared in (The) Dragon, Strategic Review, Wargamer’s Digest, and Griffon. Because most of this is source material, the majority will be usable with any rules set. [00:05:30] The goal is to make these products available in both print-on-demand and electronic versions. Victor discusses issues related to OCR scanning in material with non-English words. It’s not just a matter of getting a scan correct, it’s also about making sure that the document is easily searchable. Diacritical marks can make this a tedious, time-consuming endeavor. [00:09:53] More about the Jakállan Underworld project. We have completed the text, and we have scans of the Professor’s original key. There are three maps total, one 22″x28″, and two 8″x11″. [00:10:51] All of the maps are heavily detailed, and represent the “good bits” version of the Jakállan Underworld. This is a good example of the differences between “game” and “real” Tékumel. (See HoBI Eps. 13 and 14). Many underworld fixtures are placed right next to each other, rather than being separated by miles of dangerous tunnels. [00:13:07] This product is a facsimile of the original materials, which is to say, this isn’t exactly how Professor Barker ran it. [00:14:14] We’re consulting with Jeff Dee and Alan Grohe of Black Blade Publishing on printing the maps. We’re also considering the map of Katalál drawn by Alyssa Fadon, and available through Jeff Dee’s DeviantArt. [00:15:30] Will the publication of the Jakállan Underworld somehow diminish its legend? No, but it does alter it somewhat. It’s also an example of dungeon design in the early days of roleplaying. The only comparable thing we have are the extant portions of Dave Arneson’s Blackmoor Castle, and Rob Kuntz’s El Raja Key. We don’t have Greyhawk. [00:17:15] James updates us on the status of volume 8 of the Excellent Travelling Volume. His intention is to present enough material to enable referees to kick off a whole campaign in Sokátis, but that alone makes it a daunting task. [00:19:45] James wants to talk about Tékumel material related to military campaigns and wargaming. 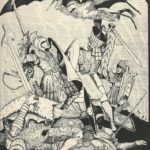 [00:20:19] There have been at least three official wargaming rule sets for Tékumel. Legions of the Petal Throne, Missúm!, and Qadardalikoi. But there are probably many more unofficial ones out there. [00:22:10] One of the paths for advancement in EPT is though the ranks of the military. With the EPT rules, the idea in the Professor’s campaign was that a player’s warrior would rise beyond the level of a foot-soldier (Ts. changadésha and kuruthúni) and into the higher ranks of the Tsolyáni legions (a tirrikámu of a semétl of 20 men, a heréksa over a karéng of 100, or a kási over a tsurúm of 400). These individuals were supposed to lead their troops onto the battlefield. [00:24:28] The culture of gaming in the ‘70s and early ‘80s was heavily geared towards wargaming, where it originated. Today, many see Tékumel as primarily a roleplaying game setting, but there remains a devoted wargame contingent. [00:26:17] Scott is surprised that no one has adapted the miniatures rules to a computer format. Victor says the Foundation might be interested. [00:27:00] Adding a military component to a roleplaying campaign alters the focus in a number of ways. One of the biggest shifts is that instead of players having the freedom to decide where they’re going, once they’re in the military, they’re at the whim of the Palace of Ever-Glorious War. [00:30:08] If you don’t want to run the war against Yán Kór, or the Tsolyáni Civil War, you have an issue, because the cohort (tsurúm) is the smallest military unit that can act independently. [00:30:45] The Qadárni Battle is a ritualized military engagement that’s less than all-out war but more than peaceful competition. [00:32:22] Flamesong does a good job of taking a military party and turning it into an adventuring party. [00:33:21] When you move beyond the rank of kási (e.g., molkár, dritlán, kérdu) you’re fighting a battle of bureaucracy more than anything else. [00:33:44] Professor Barker initially expected that players would have their characters stop and get involved in battles against enemy forces, but he found that these players would order detachments of their forces to handle enemies, while the main force kept going. [00:37:27] Being a commanding officer is very different from being part of the priestly or sorcerous retinue of a legion. [00:38:38] In Professor Barker’s campaign, were miniature battles played out when the players’ forces engaged in battle? Often, but not always. Battles weren’t always gamed out, nor were their results always incorporated into the larger world. [00:39:23] A common saying at Professor Barker’s table was that “the dice never lie.” But it is a significant gamble to have the direction of a whole game world hinge on a miniatures battle. Sometimes he would stage a miniatures battle, and then finesse the result to integrate it into the larger timeline he had established. [00:43:30] An example from the Professor’s letters. Using Missúm! rules, the Professor gamed the Battle of the Temple of Chanis three times. Twice the Tsolyáni won, and in one case the Livyáni. The synthesis of the result appears in The Dragon #4. [00:45:50] Our hosts discuss the possibility of future rules related to war battles. Maybe there’s room for System 7 Napoleonics for Tékumel? [00:46:39] Part of System 7’s approach was to use printed chits in place of miniatures. [00:47:45] Scott came to the same conclusion with computer games, that you wouldn’t need fancy graphics, just some way to visually represent and distinguish the forces involved. [00:48:02] Some military aspects of Tékumel that don’t get talked about very much, but might provide the basis for an interesting campaign follow. [00:48:41] There are a whole bunch of quasi- and non-military units that are essentially reserve elements for the true military. These include city and town guards, Sákbe road guards, temple guards, the guard of imperial governors, and various other non-land based forces like marines. One way to run a military campaign is to start players in the city guard. [00:50:37] The temple guards of Vimúhla and Karakán are actually true military reserves. If Tsolyánu goes to war, they can be called up. [00:52:38] Another traditional role for military characters is as staff officers assigned to legion headquarters. [00:54:54] Another way to start a military campaign is to have the Imperium reestablish an inactive legion, or create a new one. The legions of the Tsolyáni army, and the numbering system are discussed. [00:56:06] An example from Professor Barker’s campaign, the reestablishment of the Legion of the Searing Flame. [00:57:00] There’s a hierarchy to the military roles in Tékumel , from the city guard to the actual units. There’s a lot for players to explore in and game whilst advancing up the ladder. [00:57:47] How about players as tomb guards? This is an interesting basis for a campaign, especially if their legion is one aligned with the Dark Trinity. [00:59:31] An hour in, and we’ve barely touched on the military aspects of Tékumel. Sea-borne forces, the militaries of the smaller states, foreigners and non-human units — there’s a bunch of stuff to talk about. Suffice it to say that players of characters interested in a life in the military have many options. Flamesong, Professor Barker’s second novel, remains out-of-print, but is easily acquired through online used booksellers. The Tékumel Foundation plans to reissue it in print and electronic versions in the near future. Legions of the Petal Throne was published by TSR in 1977. It was the first set of rules for miniature battles set on Tékumel. Missúm! : Miniature Rules for Tékumel was published in 1978 by Imperium Publishing. Qadardalikoi: Miniature Campaigns on the World of Tékumel is also out of print. It was published in 1983 by Tékumel Games, and is a companion of sorts to Swords & Glory. Seal of the Imperium was a journal devoted to the world of Tékumel . A total of three issues were published. The account of “The Battle of the Temple of Chanis” appeared in The Dragon #4. This issue, subtitled “Special Empire of the Petal Throne Issue” is cover-dated December 1976. The magazine was originally published by TSR, and titled The Dragon until 1980 with issue #39. The Dragon #4 can be viewed or downloaded free-of-charge here. The army lists referred to by Victor can be found in various supplements, among them Deeds of the Ever-Glorious: Histories of the Tsolyáni Legions. This is available as a PDF from RPGNow. Richard Hescox is a professional artist of fantasy and science fiction works. His website can be found here. The first issue of The Wargamer’s Digest appeared in 1973. This venerable publication was the brainchild of Gene McCoy, who produced new issues regularly for a quarter of a century. Griffon Magazine was published by The Adventurers’ Guild from 1988 to 1990. It saw six issues. Among other things, Black Blade Publishing has published Swords & Wizardry and OSRIC, both “old school revival” rules sets based on the 1974 edition of Dungeons & Dragons. It was founded by Jon Hershberger and Allan Grohe in 2009. Alyssa Faden is a professional fantasy cartographer. She designed the Katalál Area Map for Jeff Dee’s Béthorm setting. Blackmoor Castle was an early mega-dungeon that appeared in Dave Arneson’s roleplaying campaign. Rob Kuntz’s Castle El Raja Key was another early dungeon. Portions of these works, as well as many related documents, are available at the El Raja Key Archive. Jon Peterson’s Playing at the World is a thorough discussion of the origins of wargaming and roleplaying games. It is available from Amazon. Jon’s blog is here. System 7 Napoleonics is a rules set for wargaming that replaces miniatures with tokens. It was published in 1978 by GDW. Glen Cook’s The Black Company novels follow a mercenary unit in a fantasy world. Green Ronin published a d20 campaign setting for the world in 2004. You can email us at citizen@tekumel podcast.com. You can also find us at our website, on Twitter, or on Facebook.